Prachuap Khirikan province is known not only for its popular seaside resort town of Hua Hin, but within a landscape spanning over 230,000 acres of mountains, jungle, plains and seacoast, it is rich, fertile, and serves as a home to Thailand’s rare wildlife. 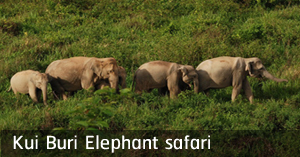 Serving as a watershed area, the Kui Buri National Forest Reserve is located within the province, and is becoming better known for its recent success in increasing the number of wild elephants in a protected environment. With seven or eight new baby elephants born every year, the newcomers gradually add to the already existing 200-250 wild elephants born and bred in the area. Our day on the elephant safari start from one and a half hour driving to Khui Buri National park our first stop will be at the Ranger station where you're able to watch Oriental pied hornbill. Then we continue further to monitor the wild elephants eating and playing in the natural pond at the forest park. We may have chance to see many other wildlife as well. Late lunch will be serving on the tour. · All prices included English Speaking tour-guide, Lunch, Entrance fee, Air-con Transportation and pickup truck in the park etc.